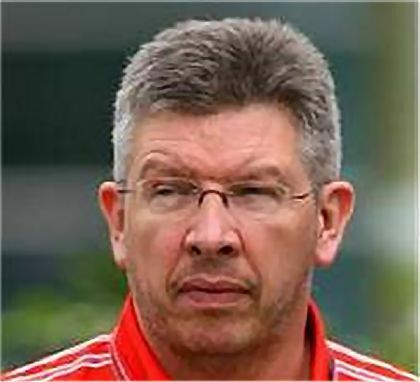 Honda have announced that Ross Brawn will be their F1 team boss for 2008 and onwards. As regular readers will be aware, I hate to say "I told you so", but I did, way back when Ross first went on sabbatical at the end of 2006. It was obvious that the Italianization of Ferrari, once set in motion by Luca di Montezemolo, would ensure that all the positions of power would be occupied and entrenched in classic Ferrari fashion by the time Ross came calling again. It is no surprise either that the promised move of Jean Todt to CEO and his replacement as team boss by Stefano Domenicali has been forced through, now that Brawn has been talked out of the equation. Nostalgia forces me to greet the news with joy as we return to the glorious days of Ferrari internal politics and mediocrity on the track. And now we can expect a sudden improvement in the fortunes of Honda F1, a fitting riposte to Jenson Button's recent expression of frustration at the poor performance of their car this year. Ross Brawn is not a miracle worker but you can bet on two factors at least: he will ensure that the team is knocked into shape and functions efficiently, and their race strategy will no longer depend upon luck for getting it right. Ross has always seemed to me a Patrick Head with added diplomacy. He is relaxed and polite in interviews, even joking on occasion, but one senses the steely determination and insistence on perfection lurking beneath the surface. I know that, if I worked for him, I would do my utmost not to make any mistakes! That is a major part of the success that Ferrari experienced during the triumvirate years, I think. Michael Schumacher gave the team a hero to give their support to and Ross ensured that everyone worked together and at maximum capacity towards the common goal. Rory Byrne and Nigel Stepney were important members of the team too, providing design skills and engine development, but I suspect that Todt's major contribution was the hiring of Michael and Ross in 1996. In the three years in which he ran the team before that, there had been no sign of any improvement in their fortunes. The occasional chaos and bad strategic decisions we witnessed in the Ferrari camp this season are also evidence that Todt's importance has been largely overestimated in the past and Montezemolo may well be correct in seeing his skills as more suited to the boardroom than the race track. It is perhaps ironic that Nick Fry has been "booted upstairs" in similar fashion to make way for Ross Brawn, although I'm sure that Nick was instrumental in that particular decision. Obviously, the 2008 Honda will have already been designed and nears completion; it is too late for Ross to have any major impact on that front, therefore. We can expect a year's delay before his influence ensures a significant improvement in Honda's design philosophy, just as we had to wait for the results when Adrian Newey went to Red Bull. But you can bet that the team will now make the best of whatever the car turns out to be in the coming season. No more floundering around, wondering where they went wrong! Ross will keep them at the grindstone until they get it right and that has to be good news for Button and Barrichello. Talking of betting, it might even be worth having a few dollars on the Honda team for 2008 for those gamblers amongst us. There is nothing that galavanizes a team towards success more than a thoroughly embarrassing year in which they got everything wrong. It may be that the designers and aerodynamicists have learned from their mistakes and that the new car will be as good as we expected this year's to be. If so, it was going to happen anyway. And Ross Brawn's main task might consist only of ensuring that the team make the best use possible of a very competitive car. I'll not make any silly predictions of a championship for Jenson this time, however! I wonder whether Jenson's recent comments hint at some kind of internal strife at Honda and his comments were made to tip the balance in favour of Brawn being signed. It will be interesting to see how Ross adapts to not having carte blanche from the FIA on matters of disputable legality. I also find it a facinating co-incidence that in the week that Honda announce Brawn his protege Schumacher announced he is getting back behind the wheel. Now you start the cogs turning, Steven! Would that be possible, a Schumacher return in a Honda? Oh, Rubens, keep looking over your shoulder! Difficult to say regarding any internal battle over whether Brawn should be taken on or not. Fry was certainly for it all along and I would imagine the whole team would be too, given the man's reputation. So any dispute would have had to come from the Honda board. Perhaps they didn't fancy paying what will no doubt be a fairly hefty salary for Brawn's services. And as regards debatable legality, let's be fair to Ross and remember that Stepney seemed surprised that the new management did not want to know his thoughts on the illegality of movable floors (assuming that he was telling us the truth) - and this suggests that the previous incumbents would have taken notice. Brawn was responsible for the traction control fracas at Benetton and he was in Schumacher's ear when he was ramming people and parking in Monaco. With the team acknowledging that their 2007 contender was such a dog at an early stage - and therefore starting work on their 2008 car early – I would be amazed if Brawn’s impact would be so great, so soon as to turn them in to title challengers. That makes it more difficult to find a market in which to back them. It will be interesting to see what quotes the spread firms give about their season points total. I doubt any will be predicting anything as poor as a repeat of this season, but if the buy price is low enough then I might be temped to take a closer look. This is the team that gained a victory in 2006, Punter, plus a few good additions that can only make it better. Okay, they went up a side alley this year but they can only learn from that and come back even stronger. I would say that they're a pretty good bet, especially as you should get very favourable odds. At present they are best-priced around 28/1 to win the Constructors (unless you have bigger lines in the states? I checked Bodog but it was OTB). If you could find somewhere that would give you each way terms of 1/5th 1,2,3 then you are getting real odds of less than 5/1 for a top three finish (writing off the win part). A repeat of their 2006 performance of 4th would not land that bet. In 2006 they scored 86 points, this year just 6. If the spread firms pitched their quote at around 35 - 40 constructor points then I might consider a buy. Of course you could just bite the bullet back them outright and bask in your glory (and riches!) when they romp the world championships! It would certainly be a story to tell!